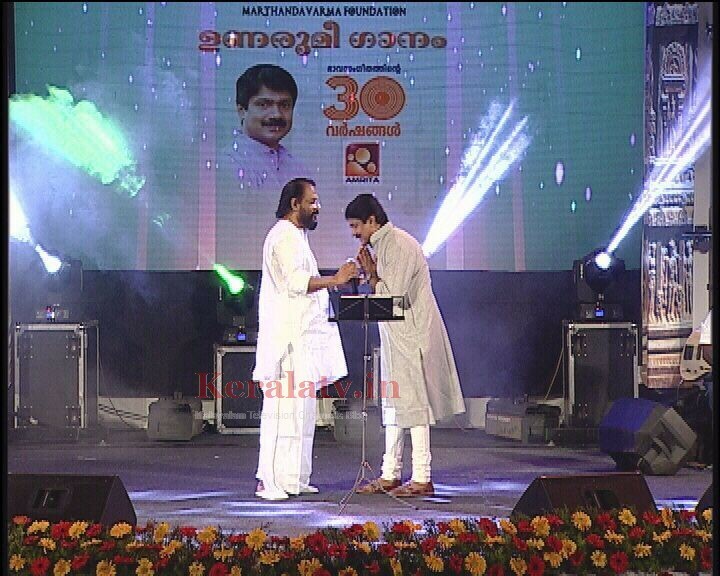 Recently Sree Uthradom Thirunal Marthandavarma Foundation and Amrita TV joined hands to hold a Musical Night which had the twin objective of a tribute to late Shri Uthradom Thirunal Marthandavarma as also Completion of 30 Years by Singer Shri Venugopal in the field of Music. The galaxy of musicians & artists who participated and performed in this function called Unarumee Ganam consisted of playback singers such as Yesudas, Hariharan, Unni Menon, Chitra, Sujatha, Sreenivasan,Shwetha, Vijay yesudas, Krishnachandran, Sreeram, Vineeth Sreenivasan, Jassie Gift, Madhu Balakrishnan, Manjari, Gayathri, Arundhathi, Sudeepkumar, Rajalakshmi, Jyotsna, Vidhu Prathap, Aravind Venugopal, Kaladevi, Saritha, Afsal, Akhila Anand, Ravi Sankar, Kallara Gopan & Aparna Rajeev. Most of these Artistes rendered songs and melodies of Venugopal which he has sung over the past decades. The function also saw performances by Music Directors such as M Jayachandran & Sarath. On this occasion a book by Shri Venugopal “Orma Chirath” was also released by Smt Sugathakumari & Magician Gopinath Muthukad, which was followed by a Magic Show by Muthukad. The other dignitaries who felicitated Shri Venugopal were Minister V S Shivakumar and Ex Minister M A Baby.The Programme Unarumee Ganam will be telecast by Amrita TV on February 22nd from 8 pm to 9 pm. G Venugopal Is My Favorite Singer, Waiting for this Show.